I was away last weekend on family business up in Washington. My best laid plans at the start of the season to go to the Saturday and Sunday games flew out the window and I had to give away my tickets. I sat on the toilet last night for a hearty dump, checked Twitter, and saw things were afire. Ron Fowler spoke with AP reporter Bernie Wilson, stating that it was only a “vocal minority” in favor of switching the uniforms to brown. He of course based this on likely fabricated “research” and “studies”, but whatever. It’s a classic case of why you hire a PR or marketing guy to handle comments with the press as Fowler came off sounding like nothing but a doddering old man with little to no grip on reality. Which could be true. I don’t know. I can only go off of the quotes. Anyways, the arguments for going back to brown (building an identity, they look cool, uniqueness, not having a shampoo bottle logo, etc.) have been beaten into the ground. I’m going to attempt to brainstorm what Fowler/the Padres’ motivations are for keeping the blue, despite it alienating the team’s most engaged and loyal fans. Wayne Partello, the team’s Chief Marketing Officer, went on Padres Social Hour this week to try and do damage control. Unfortunately, Partello offered nothing other than generalizations, slick marketing commentary, and some inconsistent arguments that didn’t make sense once you scratch below the surface. Specifically, he tried to tell the story that the team was in the process of conducting some brand identity studies (not even studies on the uniform program) and that study was so preliminary that there could be no details shared on it. This is wildly inconsistent with the comments of Fowler regarding a “vocal minority” that was in favor of brown based on their studies, as well as wildly inconsistent with Partello himself, as Partello cited studies as well stating there was no broad majority supporting brown. Either there are or aren’t studies (there are), I believe moreso, the team just doesn’t want to share these results. I know for a fact that I, as a season ticket holder, have never been polled on which uniforms I prefer. Partello also stated that the Friday attendance of Bring Back the Brown weekend was lackluster, apparently saying that brown weekends need to be total sellouts to garner any momentum of management, while blue can just putter along at all of the rest of the games with sub 20k attendance. An unfair standard. In general, here is my basic analysis of Fowler and Partello’s comments. Fowler’s comments were off the cuff, direct and unrehearsed. Partello’s comments were made by a marketing expert who had ample time to prepare comments, spin, and a narrative, all while being lobbed softballs by fellow Padres employee Jesse Agler. If you’re looking for the truth, I strongly believe Fowler’s comments are probably much closer to it than Partello’s. 2. Dual Jersey Profit Motive: When talk arises about why the Chargers don’t just switch to the powder blues, an answer I’ve often heard has been that they enjoy the dual revenue stream of being able to sell current jerseys along with throwback powder blues. It’s possible that the Padres have done an analysis showing they can continue the current plan to sell current blue uniforms/hats/merch along with the concurrent Cooperstown Collection/retro brown uniforms/hats/merch and maximize their licensing revenue. This analysis may (speculation) show that switching the current unis to brown would cannibalize the retro revenues, leading to lower total sales/licensing revenue. I’m not sure how likely this is, but looking at this ownership group (led by private equity partners), I could see profit maximization being a huge priority for them. In my experience, the most logical reason for business decision-making is often profit maximization, and in the case of continuing an unpopular uniform program, I have to assume that there is some revenue/profit advantage to the current blues. I believe this is especially true when taking into account ownership/management’s attempts to obfuscate the issue with fabricated “studies”, deliberately muddling the retro vs modernized brown, and in general, ignoring their most loyal fans’ wishes. 3. Owners Just Don’t Like Brown: It could be as simple as the team ownership just doesn’t like brown. Fowler is a carpetbagger, but has been in San Diego long enough to link the brown uniforms to an era with a lot of losing. Or maybe he just hates brown. Maybe when he was a kid, he’d throw away his brown, burnt sienna, and copper crayons. Maybe Ron Fowler wants the team to continue using the blue of his alma mater, USD. Who knows. In the end, they are the ones who dropped hundreds of millions on this team, mix in a little hubris, and if they don’t like brown, they can be petulant children and withhold brown from their loyal fanbase. Whatever. It’s entirely possible. 4. Rope A Dope: It’s possible the team has been listening to the fanbase, their studies show brown will sell more but they just aren’t ready to make an announcement. They are just stringing us along, making us all pissed at them, and then out of the blue, possibly after a horribly awful season full of no offense and boring games (hey, like this one! ), they will make a great fan-friendly announcement that the browns are coming back, making us forget about the terrible on-field performance and horrendous mismanagement coming from the GM’s office. I don’t totally discount this. While Partello is a slick marketing guy with some PR chops, he’s not totally blind and deaf to the fan’s outcry. He hears it. Now whether he has the power to change Ron Fowler and Peter Seidler’s (remember, Fowler is a minority partner. Seidler is the money man and the majority owner) mind, I have no idea. In the end, if I were betting, I believe #1 or maybe #2 are the most likely team motivations. The team has made a concerted argument to make the following arguments: “studies” show the majority favor blue, constant creation of confusion about retro vs modern brown, a higher and extremely difficult bar for attendance to exceed to “prove” that the fans are backing brown (makes it easy to say the support just wasn’t there; meanwhile this Tuesday’s game in blue will be lucky to draw 10k to the park), and an unwillingness to share any of their research. I don’t think those arguments are made in a vacuum, they are made in a conference room while devising a PR and marketing strategy for a decision that may already have been made (remember, it takes years for a uniform program update to happen with all of the design, approvals, etc.). Now imagine this. Season ends, the Padres finished last. Padres brass calls a press conference to unveil new uniforms. Twitter goes crazy. They say the following things: “We listened to the fanbase and heard their call for retro uniforms”, “our extensive studies show that a large majority of fans support blue in the uniforms”, “we believe we’ve created uniforms that are the best of both worlds”, and hanging behind them are updated PCL unis. Fowler will have a wide grin on his face. I can totally see this happening. P.S. I will also add. 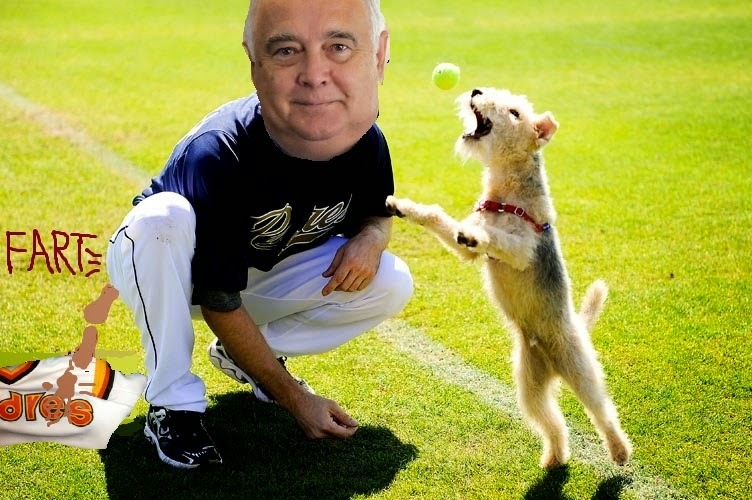 Taking an interview strategy from Louis CK, I submitted a #padresSH question to Partello asking “if Ron Fowler is in fact an alien from outer space that eats human flesh”. This question was suspiciously ignored. Not sure if you’re familiar with the idea of silence equaling consent, but this does leave open the possibility that Ron Fowler IS in fact an alien from outer space that eats human flesh. Send that “now for something completely different” to Aramco to use in their stupid commercials.